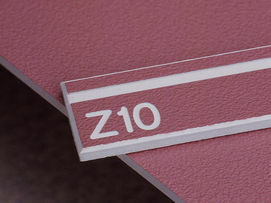 Don't idle along with neutral colors for signs when you can rev up your signpower with custom color engraving plastics. Custom cut to size, they're instantly ready to rotary engrave. Speak in more colorful language with Scott-Spectrum Match® engraving plastics that add a pleasant accent to your offices and workstations. We've been manufacturing Spectrum™ engraving materials since 1988 - and they still get better. 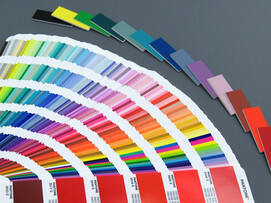 (1) Pick your colors from a Pantone swatch book printed CMYK on "glossy coated stock." Usually your engraved lettering will be white, so avoid pastels and select strong colors. (2) Tell us your choices and sizes for your sign blanks; we'll create samples of Scott-Spectrum Match® engraving plastic, just $50 per match. (3) After you approve your color samples of engraving plastic, we'll even cut and bevel your Spectrum™ sign blanks to size, at merely 50% above our usual prices. Talk about resourceful…our Scott Spectrum® textured engraving material touches all the right buttons for non-glare, fingerprint-resistant performance. Its micro-thin surface makes it suitable for rotary engraving small letters and fine lines. Available in a wide range of standard colors - and now custom too - this flexible textured engraving material likes to spend time outdoors as well as in. 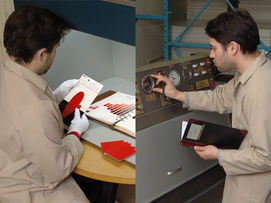 Make a match - look over the shoulder of one of our color-matching technicians as he compares a sample to a book of standards, in a light-booth that can simulate office and outdoor lighting. Make it last - our Spectrum™ engraving plastics are exposed to ultra-violet light, heat and water. It's our way of ensuring that a match that looks good today on your office walls will look just as vibrant years from now.